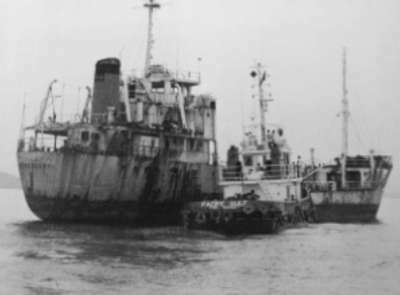 Michael McFadyen's Scuba Diving - MV Pacific Gas In 1967 a new vessel was built by the Kanawa Dock Company Ltd, Hiroshima, Japan. The ship was named Nanoyo Maru and the owner was Okuda Gyogyo KK. The ship was 65.3 metres long (waterline 60 m) and 10.5 metres wide with a gross displacement of 1,131 tons. It was powered by two 650 hp six cylinder Daihatsu Kogyo four stroke diesel engines (built in Osaka) in tandem which drove a single prop. Top speed was 12.9 knots. Electricity came from two 32 kw 225 volt generators and a total of 150.5 tons of fuel was carried. The ship had two large gas containers mounted in the two front holds. There was a smaller one at the bow and the larger one behind, right in front of the bridge. The containers held a total of 1,374 cubic metres of LPG. The Nanoyo Maru was used on the Japan, Taiwan, Singapore run under the Esso flag with a home port of Shiogama. In 1972 the vessel was sold to Liquefied Gas Carriers Pty Ltd and moved to the Papua New Guinea to Australian run. The ship was now under Australian flag with PNG crew. It carried gas for Boral Gas Pty Limited. At the same time it was sold, the vessel was renamed MV Pacific Gas and its home port became Port Moresby, PNG. Gross displacement was now given as 1,196 tons. The ship served from 1972 till the early to mid-1980s carrying gas from Australia to Papua New Guinea. The ship was then removed from service and the two huge LPG tanks removed. One was sold for use in Lae and the other for use in Port Moresby. At the same time or shortly after, the ship was sold to a group of PNG businessmen including Hugo Berghuser. He later bought them out, valuing the Pacific Gas at 65,000 kina. His plan was to ground the ship off Ela Beach, the main beach of Port Moresby, located on the southern side of the city's Central Business District. He was going to establish a seafood restaurant on the grounded ship but the Town Planner refused permission (thank God, what an eye sore it would have been). The ship remained moored in Port Moresby Harbour near Tatana Island. On 14 June 1985, the PNG Harbours Board gave notice to Berghuser to remove the ship from the port within two months. A year later the ship was till there. On 11 June 1986 a final ultimatum was issued demanding that the ship be remove within 14 days. Berghuser asked for an extension as he wanted to use the ship in a timber operation but the Department of Transport declared the Pacific Gas unseaworthy. Hugo Berghuser then gave the ship to Bob and Dinah Halstead who were at that time operating a dive operation, Tropical Diving Adventures, out of Port Moresby. Halstead removed all the doors, hatches and windows or had them locked open and cut a hole from the engine room to the second hold, giving more light and access to the engine room. 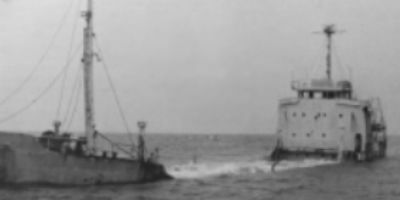 Apart from that, little was done to make the wreck safe for diving. At 6:30 am on the morning of 15 October 1986, the Pacific Towing tug, Pacific Gulf towed the MV Pacific Gas from Port Moresby Harbour. The final destination was to be the south-east side of Padana Passage. This is located to the south-east of Port Moresby and the passage is the main access to Bootless Bay. Arriving at the predetermined scuttling position at 10:30 am, Ian Short (now the operator of the PNG Recompression Chamber and provider of air fills to many Port Moresby divers), together with an assistant, set the explosive charges. Soon, Ian and his assistant hurriedly exited the ship and soon after, three explosions rocked the ship. Several minutes passed before the Pacific Gas was visibly affected and soon after it started to sink. The spot selected for sinking was a sloping bottom, with the depth running from a bit over 30 metres down to 45 metres. 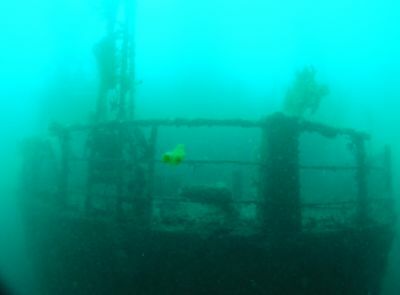 Today the wreck of the MV Pacific Gas is moored, with the buoy located just under the water. The GPS Reading for the site is 9° 35' 13"S 147° 17' 18"E using WGS84 as datum (see my GPS Page about what this means). Descending to the wreck you soon see huge numbers of large fish. Even people who detest wreck dives should do this dive just for the fishlife. The mooring is attached to a winch on the bow and there is something very exciting to be found right here. In the winch there lives a leaf scorpionfish. This one is bright pink and only about 75 mm long. It is an amazing and very beautiful fish. Follow one of the sides of the ship to the stern and you drop deeper. Go down the side of the hull and you will see that this wreck has very good growth, almost as good as some of the Chuuk Lagoon shipwrecks. The railings and hulls are covered in fixed marine growths like gorgonias, hard and soft corals as well as featherstars galore. After only a couple of minutes you will reach the prop. This is 45 metres. From here, ascend to the stern and look at the colourful railing. The depth here is about 36 to 38 metres. After this you can swim along the passageways that extend from here forward on both sides of the ship. It is a little tight but not too hard. An alternative is to enter the engine room and you can do this through a door on either side, just below the funnel. This leads to a large opening and from here you can drop down into the engine room. The engine room is quite open and easy to explore. The depth is 41 metres and both engines can be seen clearly. You can exit a number of ways, the easiest is by the hole that Bob Halstead cut in the bulkhead on the starboard forward side of the engine room. This leads you out to Hold 2 and then you can rise a little and then come back a bit along the passageways I mentioned earlier. Depth here is 35 metres. A few metres along there are doors on either side of the ship that lead to the saloon and crew cabins. There is a stairway here (the stairs are mostly gone) and you can ascend up to the next level. This has the radio room on the rear starboard side and forward of this the Captain's Cabin. Depth is about 32 metres. Once again, you can go up a level to the Bridge where the depth is about 28 metres. As you go up these stairways and in the cabins, beware that there are many wires and cables hanging down and it is easy to get caught up, I did once. However, this said, it is easy to get free of the entanglement. Note that there is plenty of light entering all these compartments. You can see the compass and steering binnacles and other parts of the Bridge. Exit can be via the windows or doors. If you have time and air, drop down into the holds and you will see that there is a lot of junk on the floor. Start ascending, aiming for the bow. 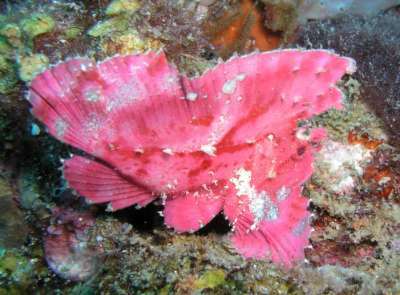 If you have time, spend some of it looking at (or for) the leaf scorpionfish. Once you have decided to ascend to the surface, you can go back up the mooring line or, more interestingly, up the forward mast. This goes to about 8 metres and you can easily see across to the mooring line to complete your decompression/safety stop. This also gives you an excellent opportunity to see and photograph the hordes of fish, trevally, mangrove jacks and other species, that swirl around the mast. This is a great dive, both for the wreck and the fishlife. When I dived here visibility was about 15 metres, although I was told that it is normally about 20 metres or more. Water temperature was 26°C. I did a 26 minute actual bottom time which required a six minute stop at three metres. I went into decompression at 13 minutes.